Number of servings: 10 appetizers or 4 main course. Using kosher or rock salts to make a bed to hold the oysters during cooking keeps the shells from tipping, spilling savoury juices and also keeps the oysters hot as they go to the table. For presentation, use an oven to table baking pan, which will hold ½ inch of salt. 20 oysters, shucked on the half shell. Reserve liquor. Set aside. Spread kosher or rock salt ½ inch deep in baking dish which will hold oysters. Preheat oven to 400F (200C). Place baking pan with layer of salt in oven to heat. In a skillet, melt butter; sauté parsley, watercress or spinach, shallots, celery and green pepper. Cook 5-6 minutes over medium heat or until watercress or spinach is wilted. Stir in remaining ingredients, except the oysters, adding a little extra cream or bread crumbs as needed to achieve the consistency of a thick sauce. Spoon the watercress or spinach mixture over each oyster meat, dividing evenly. 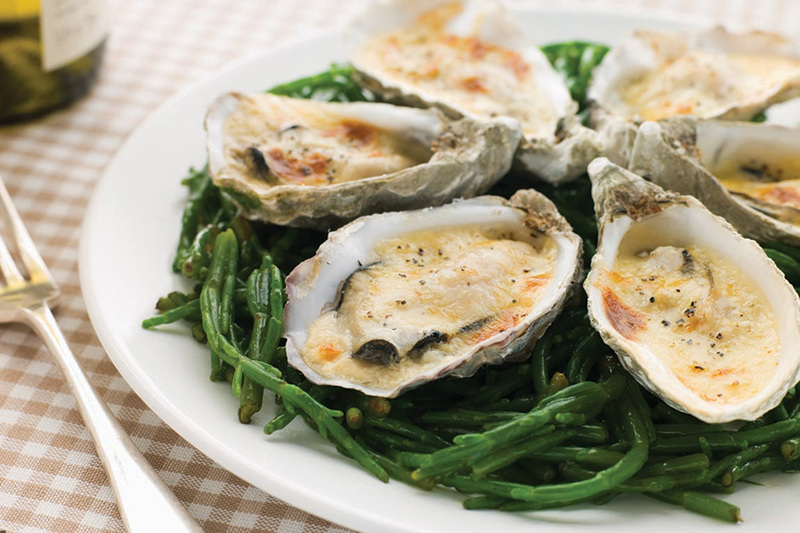 Place oysters in the baking pan, return to the oven and bake 4 to 6 minutes, or until hot and bubbling.